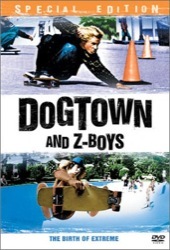 You would not expect a documentary about the slacker origins of skateboarding culture to hold your attention for more than 10 minutes, but Dogtown and Z-boys certainly does. It unleashes a steady stream of surprises, beginning with a small band of juvenile delinquents and outcast school kids who were so downtrodden they were kicked out of good waves in Santa Monica California. They then began to surf dorky skateboards. Soon they were amusing themselves with breaking into vacant backyard swimming pools and “taking on air” with zany skateboard antics and a lot of attitude. How this small-time obsession became an international sport, entertainment and merchandising complex is the rest of this amazing and well-made story. I consider it a key document of contemporary American culture.